« Mohair On The Rocks. a goat will do so. I don’t think this is true of sheep. 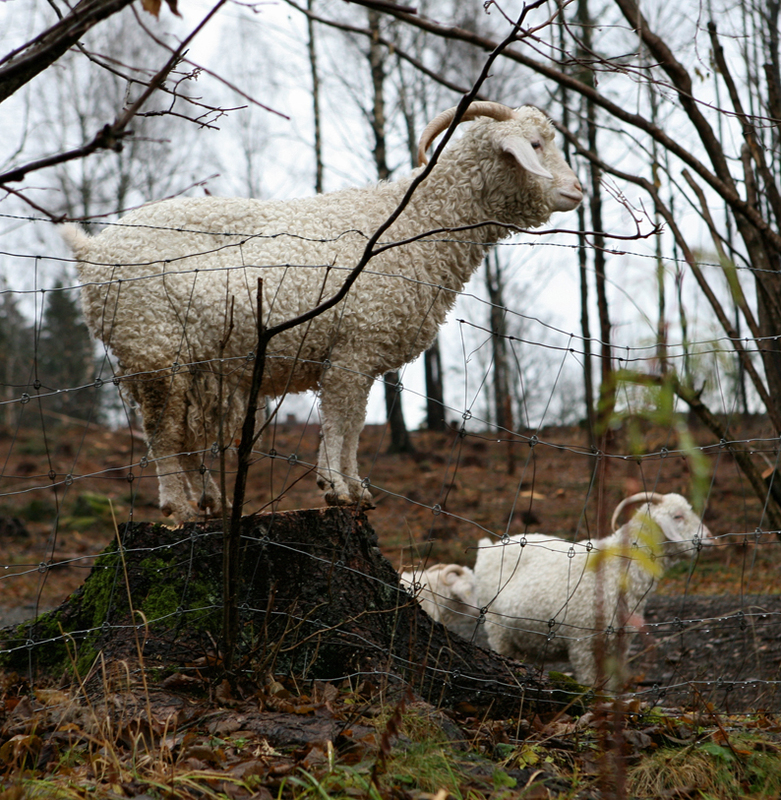 Goats are mountaineers, sheep are not. Not exactly. In Transylvania for example the mountains are packed completely full with sheep. Those are outstanding pictures of sheep, particularly the first one. The ones in the second picture have horns, but they aren’t goats. I really like the look of the Rumanian sheep farm in the last link; I could eat some of that cheese right now. I wouldn’t say that any of the sheep are standing on top of something, unless you could the mountain itself. Not like our goats. I don’t mean it as a criticism. of course I have not intended to opacate this important criterion of distinction. Just my conscience has not allowed me to consent with marie-lucie’s exclusion of the sheep from the distinguished club of mountaineers. I’m not sure I would agree with the usage of “much” more sheep, though. “Much” is non-count, and where I come from, we count sheep to go to sleep. Some nights we have to count many, many more sheep. Sheep do seem to make good mountaineers though, although I suppose not all mountaineers are sheep. Sheep can indeed go up and down slopes, but they can’t just bound gracefully among rocks like goats do. We have sheep at our cabin in the mountains. We don’t own them of course, they’re local sheep who like to take shelter on the verandah. I’m thinking of building them their own little pavilion, they make a bit of a mess. For some reason, they love to lie on concrete; I can’t imagine it’s very warm. They like other, damp concrete too. Any sheep that are afraid of grass are in the wrong job. The sheep in the first photo have such long and thick wool that they could probably lie on any surface and like it. Beautiful pictures of Scotland and of sheep. I had seen Burns’ poems written but never heard them, and at first I thought that I was hearing Gaelic, except for “my bonnie dearie”. On listening again I understood a little more, but I can see why Scots is considered a different language. In the second picture, one of the sheep is pretending to be Benjamin Franklin. It has a lightning rod on its head, and a wire going up into the sky. Thank you very much Dearie. Now we know where your nom de plume comes from. VERY nice sheep. Also heather & Scottish bluebells (aka harebells). Grumbly, they are as close to sheep as you are to a water-beetle. Next summer I’m making them G O A T t-shirts. Thanks for the “Wittgenstein’s nephew” book recommendation, by the way. m-l, as Burns often did, he wrote that poem in a mixture of Scots, Scots English and English English. But in my childhood, we counted yin, twy, thry…. Scots was just about hanging on in the playground. With my parents and teachers I spoke Scots English – which is close to English English, but better. Crown, did you ever read the Salinger short story I’m talking about? Does anyone know it?? Stu, I must admit I have only read Catcher in the Rye. Re Wittgenstein, I see that during WW2 Salinger had a short story rejected by the New Yorker, called “I Went to School with Adolf Hitler”, but it’s probably about something quite different. The story occurs, I think, in Raise High The Roofbeam, Carpenters!. It’s about a little boy who suddenly became withdrawn and teary. His mother finally extracted from him that boys at school had been calling him “kite”. The boy didn’t like the idea of flying in the air at the end of a string. Well now you’ve spoilt the ending I suppose I’ll have to read it. Dearie, “yin” is very close to Norwegian en (one) in its pronunciation. Perhaps “try, thry” doesn’t imply the pronounciation: tw-eye, thr-eye. Not all that different from Deutsch. P.S. My father used to joke that I’d been bounced on Dutch and Norwegian knees before ever I’d met an Englishman. What does it mean? Call the ewes to the meadows? Google translate doesn’t do Scots. empty, I’m just wondering – did you already know that story from back when? Or did you find it just now by internet magic? I like your new font size, by the way. Very oomphy. It’s a fat Ø, a post-Thanksgiving dinner Ø , a full Ø , if you will. But empty, when you make a comment you should put your blog name in the “website” box in case someone feels like visiting you. I read several of Salinger’s books way back when, but had a very hazy memory of most it. Internet magic is the answer. I commented elsewhere last night and deliberately concealed my identity for playful reasons, hence the lack of address. I didn’t realize that my laptop would carry this over to the here and now. Change in font size or whatever is also accidental, but I like it.